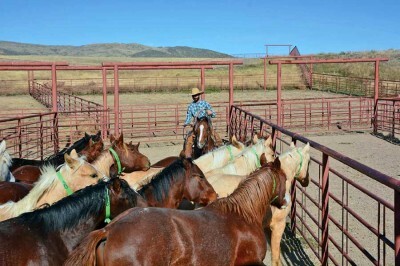 Every day, trainer Matt Koch uses a show horse to gather cattle. “We like to treat them as horses as much as possible,” he says. As you’re reading this, it’s January. The first AQHA Ranching Heritage Challenge of the 2015 show year is this month during the Fort Worth Stock Show & Rodeo. The challenge is the first test for 4-year-olds bred by AQHA Ranching Heritage Breeders in the marquee 4-year-old working ranch horse class. 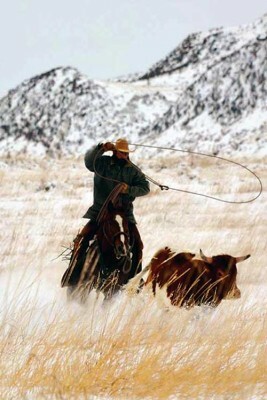 The Journal has been following the preparations of ranch trainer Matt Koch of Wagonhound Land & Livestock in Douglas, Wyoming, throughout this year as he prepares for the January challenge. On November 25, he said he thought Dual With A Shiner would be ready. Dual With A Shiner is ready for the roping part of an AQHA Ranching Heritage Challenge. It’s snowing sideways here, but I can’t complain, because I do have a dry, warm spot where I can work my horses. In the mornings, I’m still using my show horses for ranch work. I took This Cats King out today. He was out for a couple of hours in the snow and the wind, gathering cows. We like to treat them as horses as much as possible. The temperature was about 30 today, so it wasn’t terrible, but as it starts to get colder here, I’ll keep a couple of horses outside so if it’s 20 below, I’ve got some horses that have some hair on them. Hesa Hickory Cat that I showed at the Ranching Heritage Challenge at the Northern International Livestock Exposition is going to be an outside horse for the winter. We’ve started a bunch of colts, so I’ve been busy doing that for the past few weeks while our exercise riders have been keeping the show horses in good condition, just trotting them around for 15 or 20 minutes. I used Diesel a time or two to snub some colts. That was his job for a couple of days. We put 10 days on the coming 2-year-olds. At the end of the 10th day, we can lope circles each way, and they’ll all stop and back up. They’re starting to move their front ends a little bit and turning around. I’m just starting to introduce them to body control and pieces and parts. Then we turned all 34 of them back out. In the spring, we’ll start riding them again. After being on all those coming 2s and then working on my coming 3s, when I jump on Diesel, I’m like, “Oh, my.” There’s quite a bit of difference. It’s crazy what a difference a year makes. Late last week, I started working on the flag with him again, and we’ve been cutting all week long. He’s been doing really good. He came back fresh and good from the break. We fiddled around today again on some cattle. You can almost keep your hands down on him all the time. I have to help him every once in a while, but he’s getting better. Right now, our horses look big and fat and fit. We’ve got one more futurity next week to go to in Castle Rock, Colorado. My wife, Brianna, and I are going to take five days off in the middle of December for a trip to California. That will be our vacation for the year. In January, it starts up again. We go to the Denver Stock Show, then to Fort Worth, then the Black Hills Stock Show in Rapid City. I’ve got five 3-year-olds that we’ve already got inside so we can start taking them to town to the shows when we go if we’ve got room on the trailer, start letting them get out and get seasoned. The whole cycle starts over again.